You may be the author/composer or a publisher. This document can be edited easily to give the advantage to one side or the other. It covers protection for both in reasonable balance. The document refers to a named book. However, it could as well be used for publication of any single or multiple written work. Your work could be of any size, complexity and for any purpose. For example, it could be music, a plain script, a book to be converted to script, or any other “created work” or product in which you own copyright. Only you can describe it accurately. For the sake of clarity in the document, we have named your work “Black, White and Green”. You now wish to arrange to exploit your work through an arrangement with a publisher. Any publishing arrangement is technically a licence on agreed terms. See below for an alternative form of licence and for a sale of your entire rights. This agreement preserves the author’s or originator’s rights to sell the same material in different markets. It preserves moral rights as author. The agreement covers subsidiary rights in detail so that the author may receive different levels of royalty for different areas of marketing. Payment terms are also covered in great detail, so as to make clear exactly what will be paid to the author, how and when. This publishing agreement also provides protection for the publisher in several important areas. 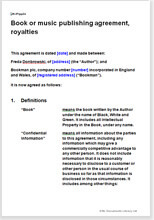 This agreement contains provisions special to the book and music publishing industry. If your created work is not directly in that sector, you may decide instead to consider Copyright licence agreement, any purpose. For a more comprehensive version of the sale agreement see Sale of rights in television, film or media production for cash and shares. If you are having a book or other text written for you, look at Copy writing contract: article, book, manual.